Some people told me I didn't need to go in order to have a perfectly proper thesis. Others urged me see the place for myself - that it would change everything. I ignored the naysayers and knew that I needed to somehow get to Port-au-Prince, and only when God made a way for that did I understand instantly - maybe even just as I saw the coast loom into view from the plane window - that this was so true. 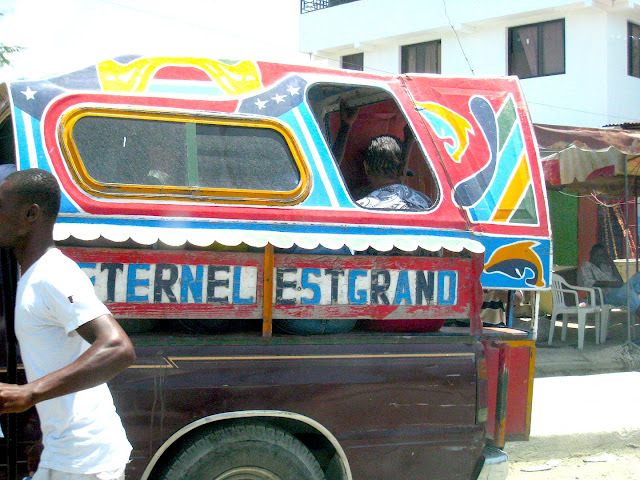 The thing that hit me - overwhelmed me, and still overwhelms me - is how Haiti engages your senses. Just reading news stories or seeing pictures isn't enough - it's not simply visual, but also intensely seizes your ears, nose, tastebuds, and even skin (because it was about 115 degrees F and humid everyday - and dusty). On the flight over there, I was puzzled by the number of Haitian men who had boomboxes as their second carry-ons. What an odd piece of luggage, I thought. Once we landed and were launched into the midst of the chaos called baggage claim, I realized what they were for: mood music, of course! They turned up the calypso and became instant DJs - perhaps to lighten the frustration that came with an hour of searching for our bags. Who is big in Haiti? The media says NGOs, the UN, and everyone who is there to help bring the country back on its feet. Tap-taps, the local bus transport, say it's God ("L'Eternel est grand"), and I would also have to say it's the people and those who stand alongside them. I still find it hard to tell people in a "nutshell" how was my weeklong trip to Haiti. There's a lot to process, but hopefully little gems will come out from the sifting of thoughts, emotions, and memories - not to mention images, sketches, and notes made along the way. I'll try to write at least one post per day I was there, in the hopes of somehow piecing out the experience.